I was just a kid when I first came across a creek where salmon were spawning. I remember the peacefulness of that day—the sun was shining, a soft breeze was blowing, and the air was quiet except for the sound of insects buzzing and the water gurgling. The fish were at the very end of their lives, discolored and barely moving, with many already floating dead. It was sad and beautiful at the same time. 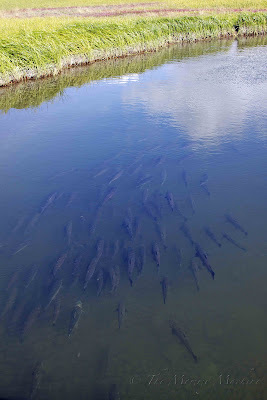 These salmon are a bit livelier, having just arrived to their spawning area. After about 4 years at sea, they've returned to where they were born and are ready to lay their eggs. 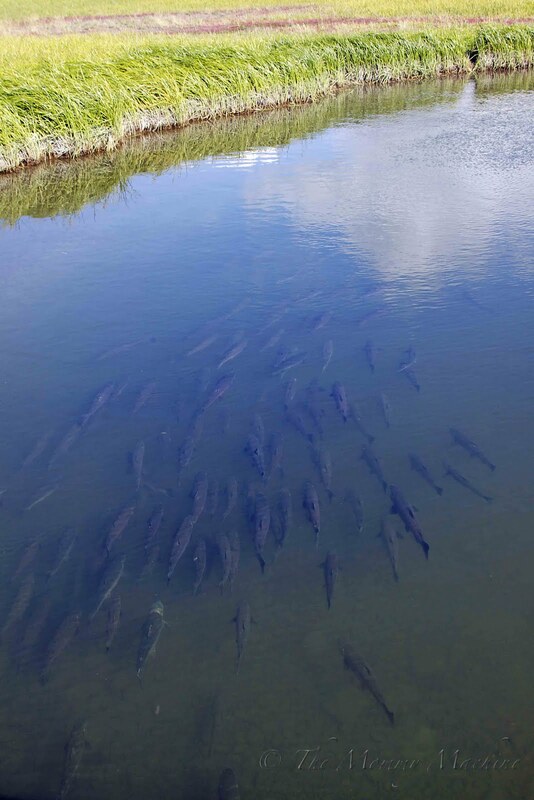 The fish basically move in place, with just a little splashing and a few tiny darts as they hover over the bottom of the shallow river where their eggs will be buried. If you look closely, you can see lots of battle scars from close calls with predators, rocks, and fishing nets. They've escaped death, only to die here. What an amazing thing to see. 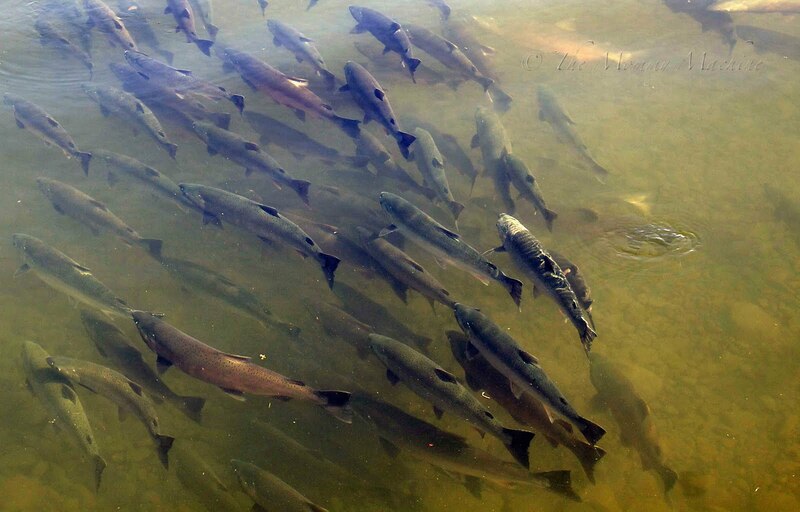 I've heard a lot about the salmon spawning, and thought it was an exaggeration. But apparently, there are a lot of fish. can you fish and eat them, or because they are going to die soon, do they taste gross? Is that a weird question to ask? I'm only asking cause they are going to die anyway, might as well get a meal out of it. Wow, what a sight! I just saw an article about salmon being plentiful this year around here too! I've never seen them though. I've always wanted to see this and never have. It's true that it's kind of a sad irony that the salmon escape death time and again just to die there, but it's on their terms and in a place of their choosing. Which makes it sort of beautiful, I think. Not a weird question at all, M! I don't know of anyone who eats spawning fish, and I'm not sure if there's one answer as to why. A lot of spawning grounds are protected to insure the following years' fisheries, so you couldn't fish there without penalty. 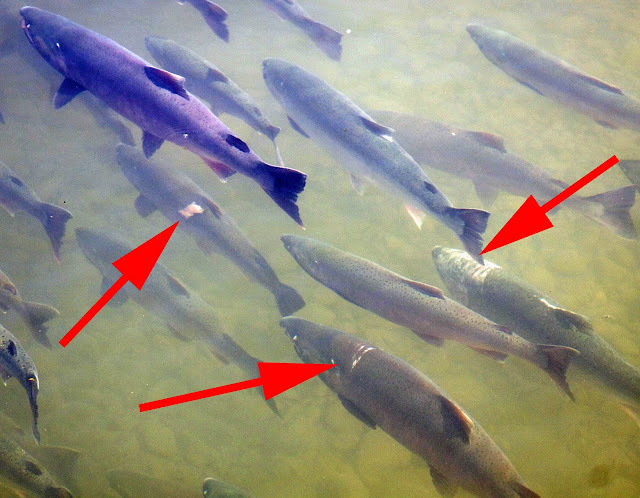 Also, salmon work so hard to get back to their birthplace that they expend all their energy, and then they stop eating, so their bodies literally start to break down. I don't know if it effects the taste of the fish, but it sure does change the texture of the meat. They're kind of like the zombies of the fishworld—the swimming dead, if you will, and their flesh gets mushy. It would not make a very pretty fillet, although you might be able to salvage it by smoking. as always, I'm amazed by the beauty of the nature that you're surrounded by in Alaska. Life seems pretty sad for most lower life forms. That's neat you get to see real salmon though. My only encounters are with the frozen kind! That is a beautiful shot. You can just reach over and catch one if you wanted to. i can't wait to see the salmon running in Alaska! Great post.